A perfect dive bar consists of cheap drinks, loud music, and a disgustingly dirty bathroom. 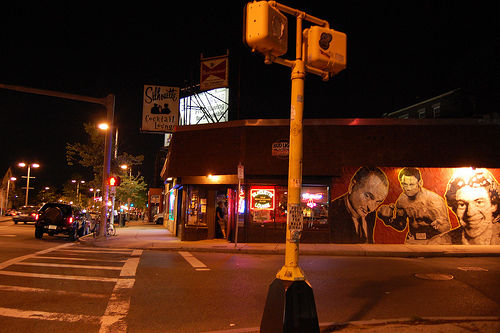 The Silhouette Lounge was named Best of Boston’s best dive bar two years in a row. “The Sil” is the definition of a dive bar, adding a sweet jukebox, fun games, and what seems like the cheapest drinks in Boston. My first experience with the Sil was positive. Every time I visit my friends on Linden Street in Allston, we like to change up the pace from the straight drinking at the dinner table. A short walk down Brighton Ave. leads to this wonderful little bar. It is a broke college student’s dream. The bar wasn’t too crowded, where most groups of people were seated at high-tables, we got to sit on the beaten stools and view the bar’s choices. A pitcher of Pabst Blue Ribbon was the poison for the night, costing a total of 7 dollars, and not to mention the free popcorn. Mixed drinks weren’t too pricey either, but the options were limited. The cheap drinks were almost deadly, seeing that we were already pre-gaming. The music was loud and they even had an old-fashioned jukebox. Darts or pool anyone? They had enough “dive-bar essentials” to keep anyone entertained. The majority of the people in the bar were in their 20’s, mainly because Allston is for either the poor adult, or the poor student. You’ll also run into the occasional “characters” that will make a night at the Sil very memorable.